Well, it seems that Tim’s strategy of taking advantage of the ability to get multiple entries for the second drawing paid off! His was the name we drew out of The Hat this morning — congrats, Tim! This was an excellent adventure. Definitely worth your reading time. Has an excellent view of what may be a possible future. Check it out. Comment if you’re inclined. Or maybe even consider writing your own review, and sharing your thoughts with others — I very much appreciate it. Anyway. 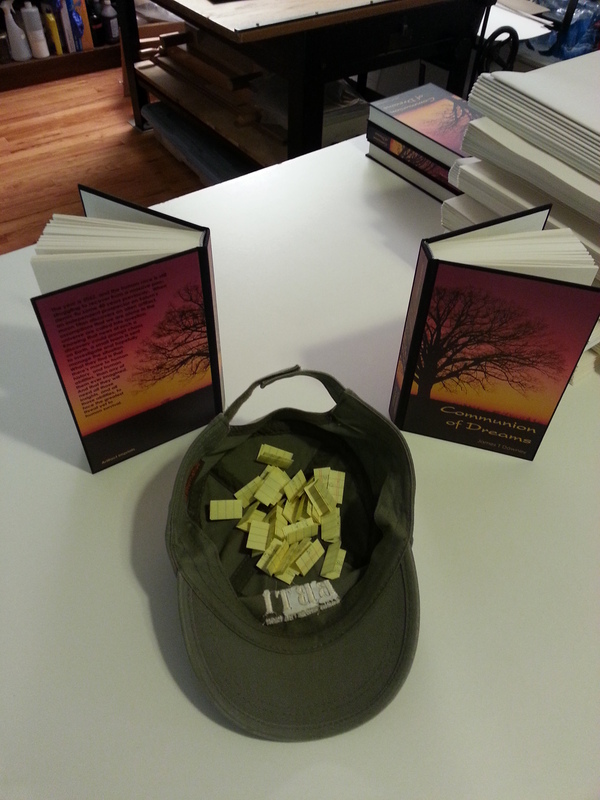 “Debi” was the name drawn from The Hat on Sunday, and she will be receiving the first of the hand-bound cloth copies of Communion of Dreams I am giving away. Why yes, I did just say “the first“. Because I am going to give away another one here shortly. OK, for all those who got their name in the last time, don’t worry, your name will stay in The Hat for the next drawing. Mention Communion of Dreams online someplace. It can be anywhere available to the public. Your blog. Your Twitter account. On Facebook. In a discussion forum. In an Amazon review. Anywhere — anywhere, that is, except here or on the Facebook page for CoD. You don’t have to link to the book, or this blog, or anything. You don’t have to say anything nice about me or the book. Seriously. Post a comment here or on the Facebook page telling me you did so. Include a link to said mention. No link back, no entry. You can enter once a day, now through Saturday. Sunday morning I will tally up all the entries, make a new slip for each one, and add them to The Hat. Please, only one entry per person per day, and open to everyone, as long as you follow the rules noted above. If you’ve already ordered a hand-bound copy of the book (or are due one from the Kickstarter) and you win this one, you can have me either send it to you or to the recipient of your choice. Easy. 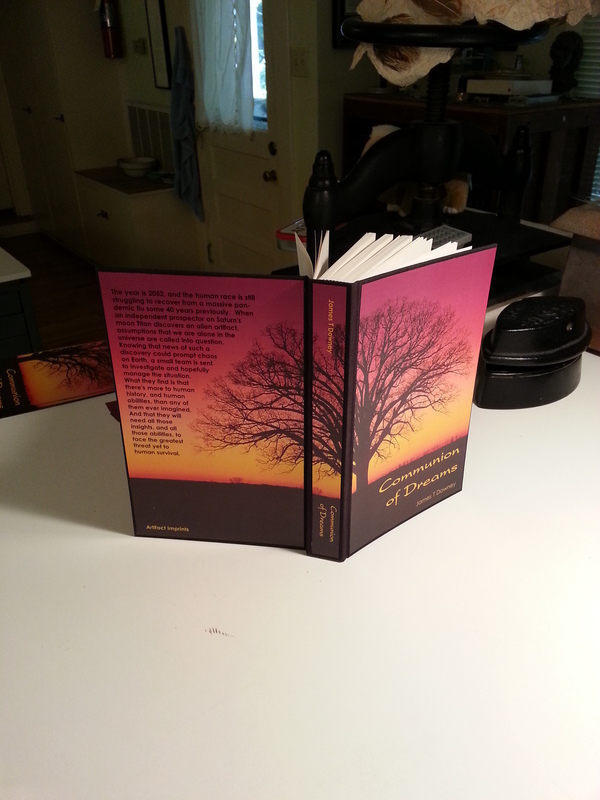 Want a free hand-bound, hard-cover copy of Communion of Dreams? And I’m really pleased with the way most of them came out. Most of them. But not all. The first several text blocks I trimmed, I had the fence on my guillotine set in the wrong place, and trimmed the top margin a little too close. Oh, it’s the sort of thing that probably only I would ever notice (seriously, it’s only about 5mm off), but when it comes to my work I’m a bit of a perfectionist. So I just wouldn’t feel right in selling them for the normal $100 price. Instead, I’m going to use them for promotional purposes. Starting with having a drawing for one now. “Follow” this blog (or “Like” the Facebook page). Leave a comment below (or on the Facebook page). Please, only one entry per person, and open to everyone. If you’ve already ordered a hand-bound copy of the book (or are due one from the Kickstarter) and you win this one, you can have me either send it to you or to the recipient of your choice. Easy. Don’t wait — get your entry in now. Gather the sections from the printed stacks. Collate the sections into books. Punch holes through the center of each section for sewing. Sew up the text blocks. 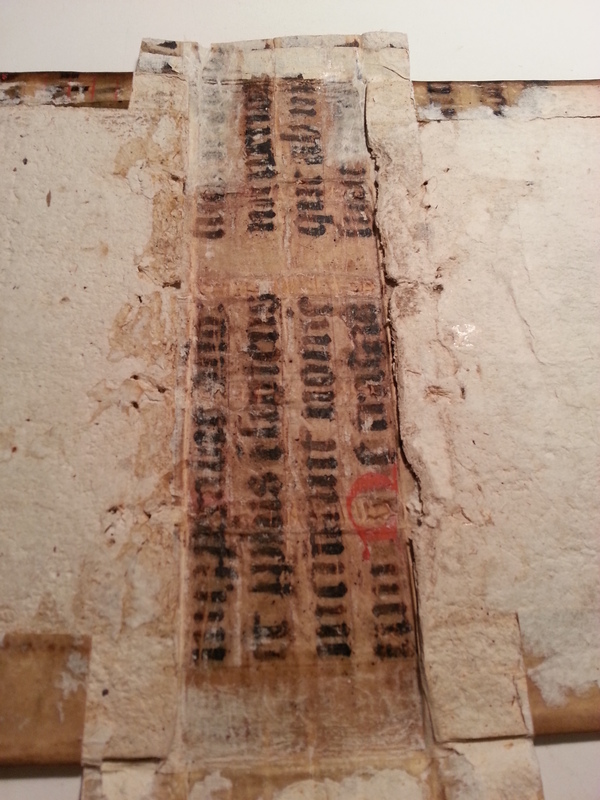 Paste up the spine of each text block, allow to dry under mild weight. 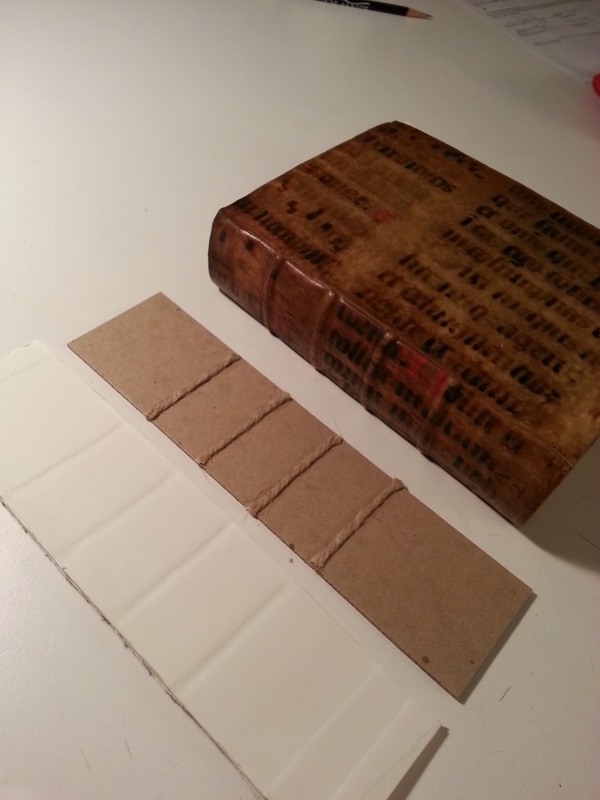 Trim each textblock to size: head, tail, fore-edge. Paste up each text block again; determine size for, cut, and add endbands. 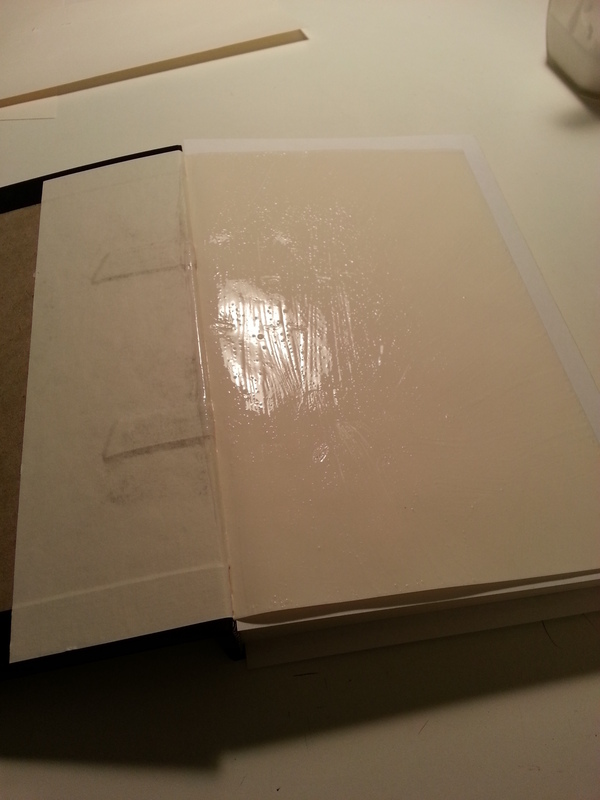 Determine size for, cut, then paste up and apply spine liners, allow to dry. 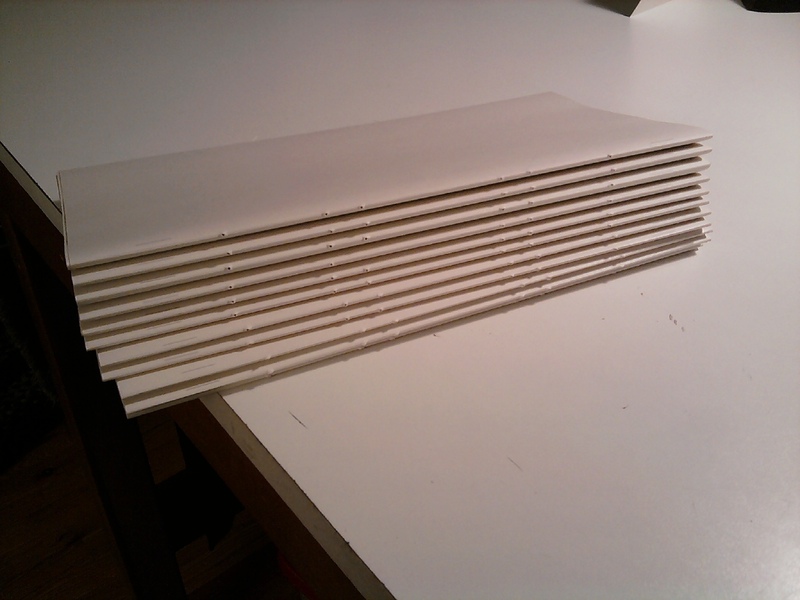 Determine size for and cut bookboard for the covers: front cover, rear cover, spine. Determine size of necessary cover cloth, cut from roll goods. 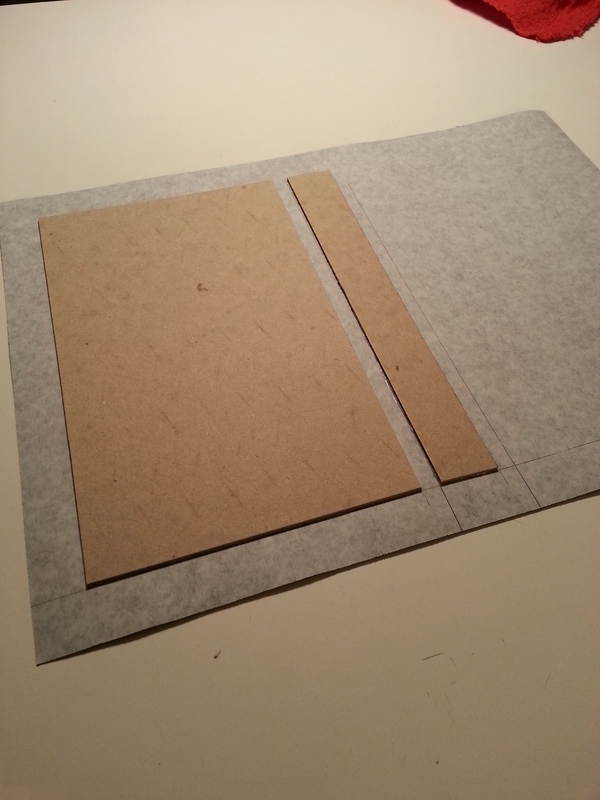 Layout and mark up inside of cover cloth for bookboard positions. 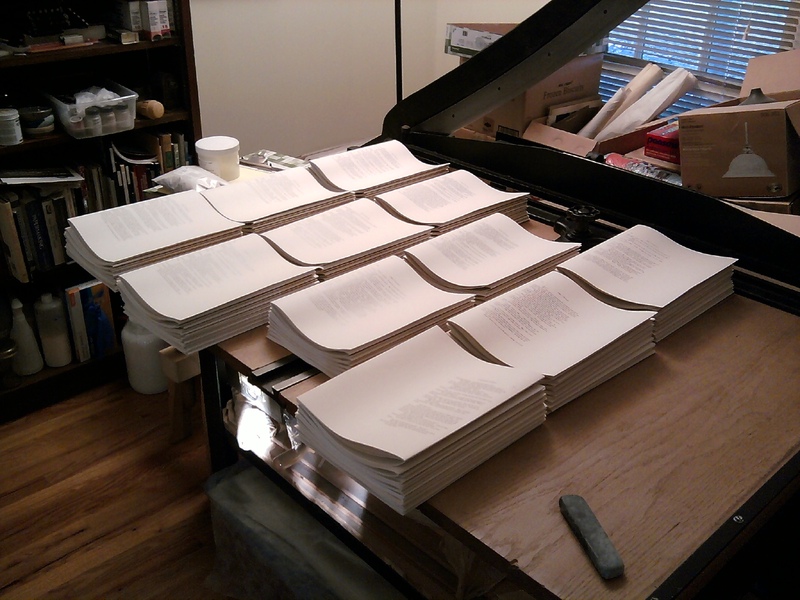 Paste up and mount each piece of bookboard, nip in nipping press, allow to dry. Cut corners on cover cloth. 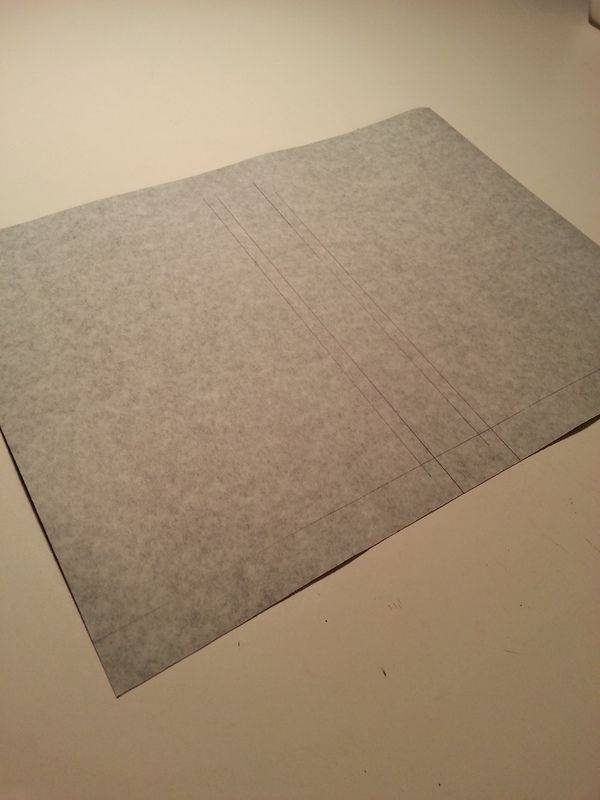 Paste up and turn in edges & corners, nip in nipping press, allow to dry. This is now called the “cloth case”. Determine size and cut cover image for mounting to cloth cases. 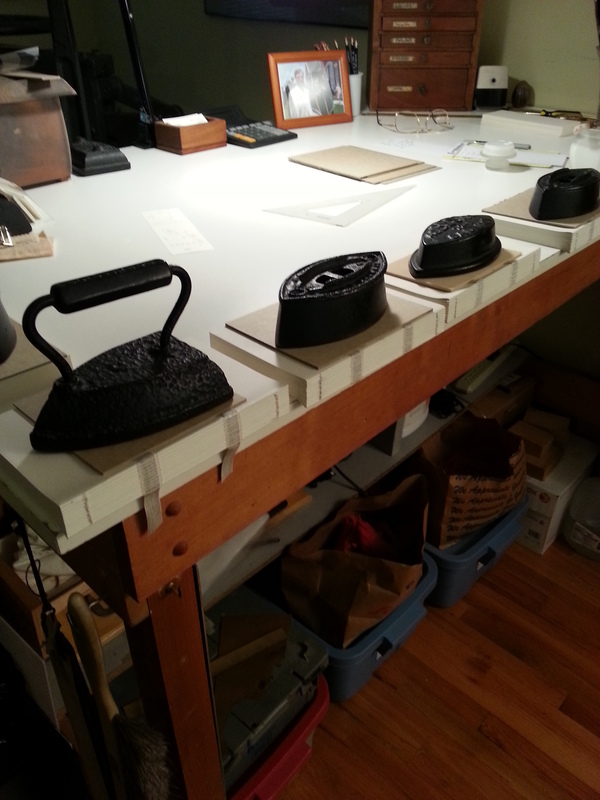 Position and mount cover images to cases, nip in nipping press, allow to dry. Trim back first paste-down sheet on front and back of each text block. 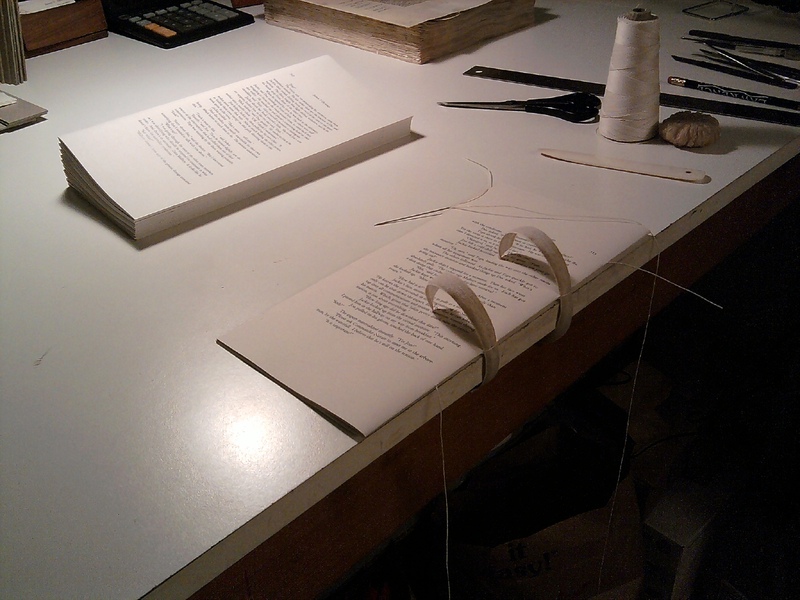 Position text block in case, paste up sewing tapes and front half paste-down sheet, nip in nipping press. 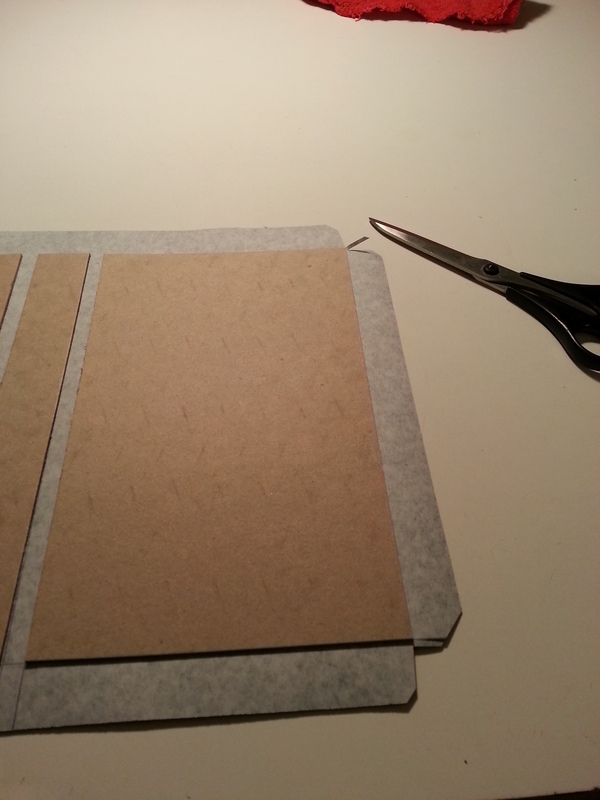 Repeat for rear sewing tapes and half paste-down sheet. Paste up front full paste-down sheet, nip in nipping press. Repeat for rear full paste-down sheet. 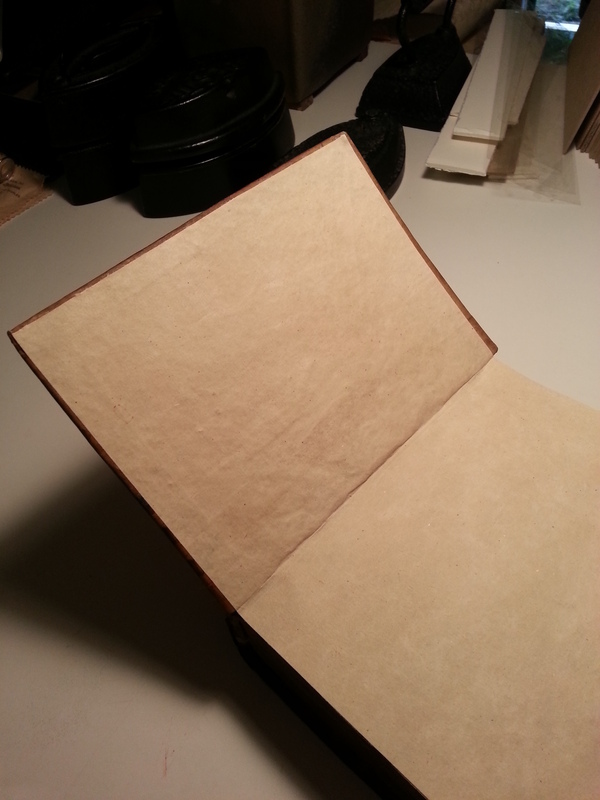 Well, it is compared to what is involved in doing the leather-covered edition. I might spend some time doing a video version of that. We’ll see. Oh, yeah — if you’d like to have your own hand-bound copy in either cloth or leather, full information on the limited edition is here. Sheets gathered & folded into sections. Starting the sewing onto linen tapes. Bottom of the sewn text block trimmed off in the guillotine. Corners cut, ready to turn in. Back cover image positioned for mounting. 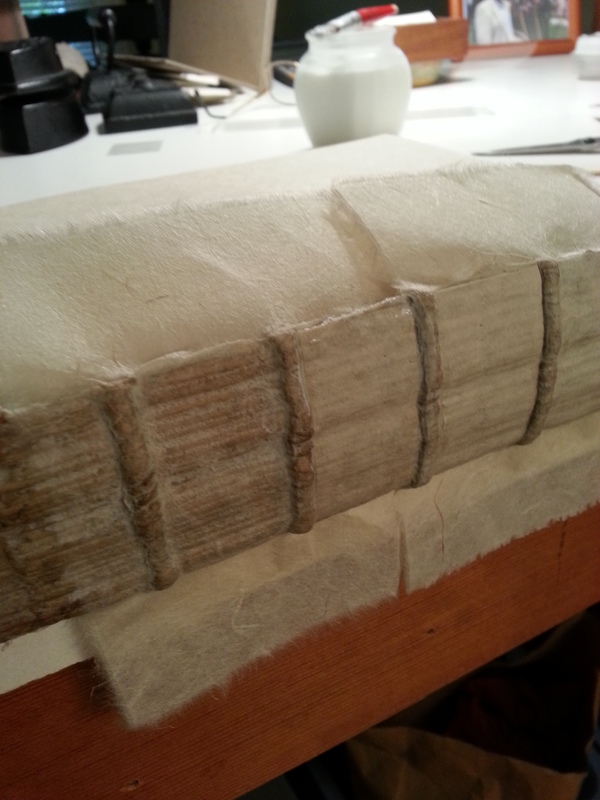 Sewing tapes and half sheet pasted out and pressed. Second paste down sheet prepared and ready to press. I mentioned on Facebook the other day that sometimes I stop and consider the sort of chutzpah it takes to think that I should be mucking around with a 700 year-old book. 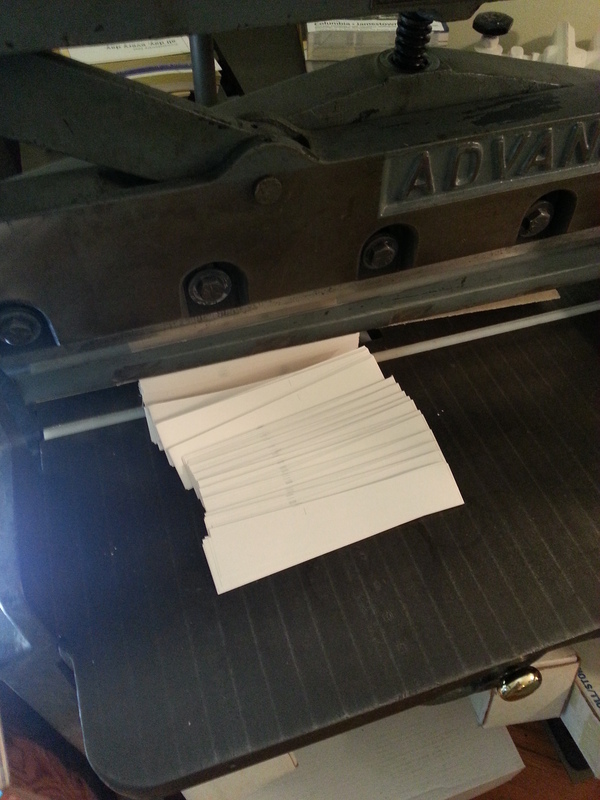 That thought occurred to me following a session in the bindery working on the bible I have blogged about earlier. I had just done some work on it, then had to put everything into one of my presses and let it dry overnight, hoping that I had done the work properly. Hoping really hard. What follows is a bit long, but might be of interest to some. At the risk of spoiling the suspense, the book came out well, though not entirely perfectly. You’ll see. 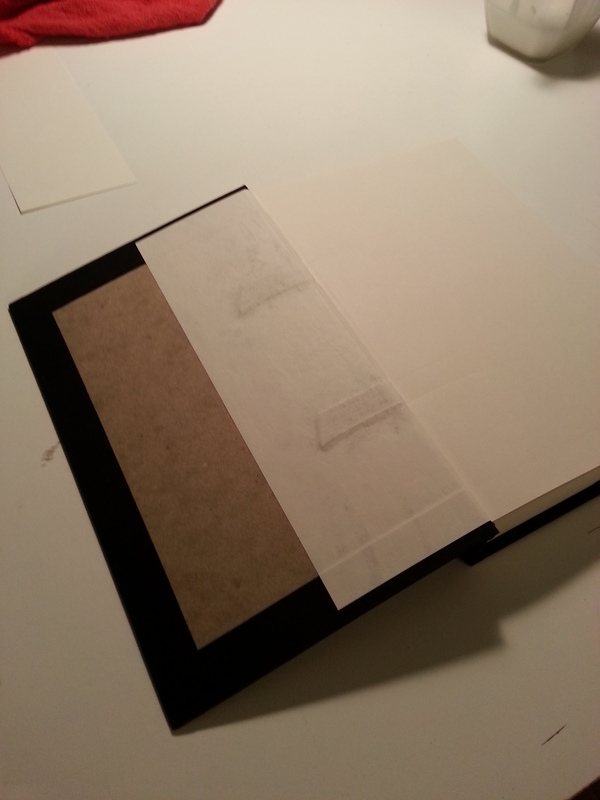 That shows the paper liners adhered to the inside of the spine cover material. If you look at the top of the image, you can see some of the damage which had happened to the book — basically, some tears in the vellum cover at the hinge joint. 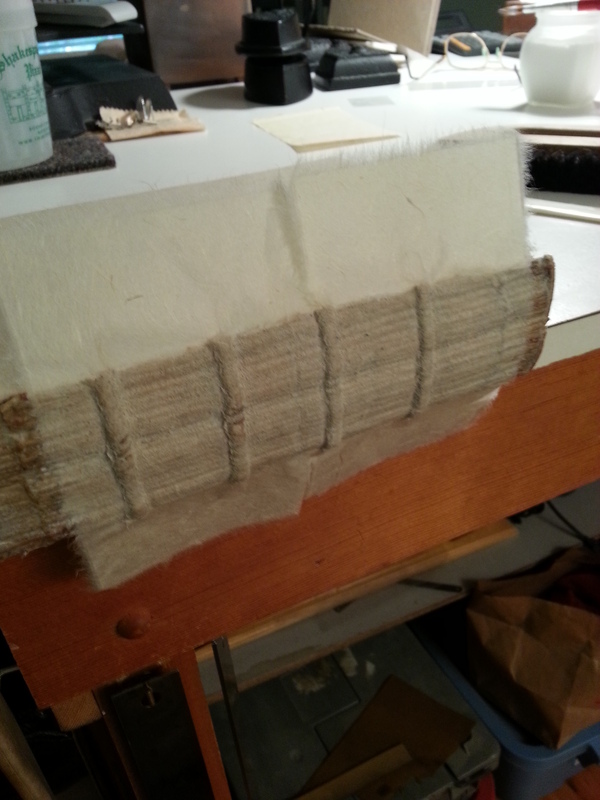 One problem – in order to get the kozo mounted securely, I had to flatten the entire vellum spine, losing the nice shaping where it went over the sewing structure cords. We’ll come back to that. 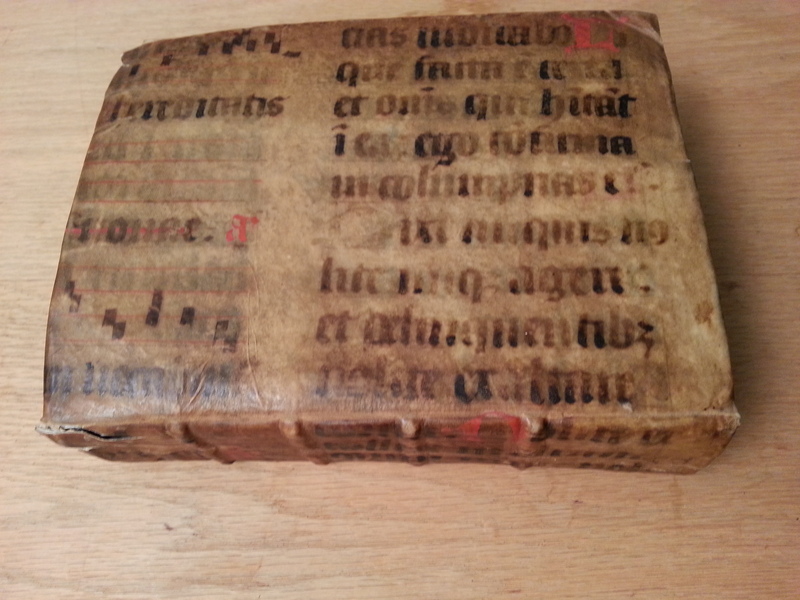 When those were done and dried, the text block was ready to be mounted back into the cover. But I had two problems. 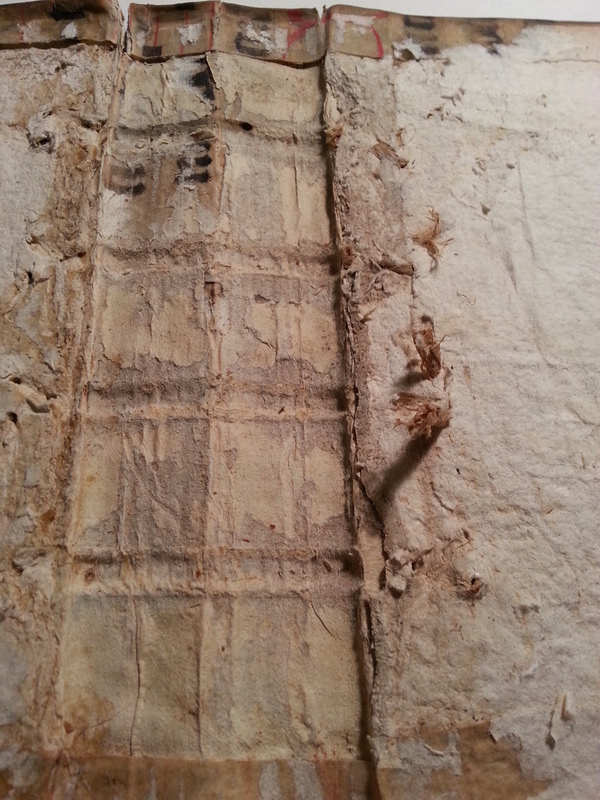 One was the spine vellum had been flattened by mounting the repair kozo, as mentioned above. 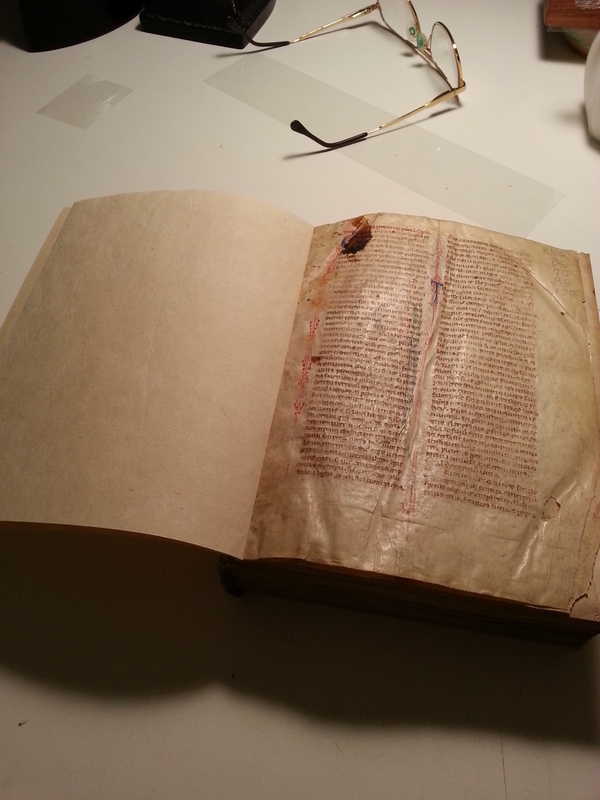 But there was also another problem, part of the reason why the book had become damaged in the intervening centuries: the vellum cover had shrunk slightly, and the text block had swollen slightly, with the result that the cover no longer fit properly. How to make it fit? Well, I had actually already done one thing: I had placed the text block into a heavy press and slowly compressed it over a period of several days. But that only did so much. That bought me about 3 or 4 mm of space. I worried about trying to stretch it any further. 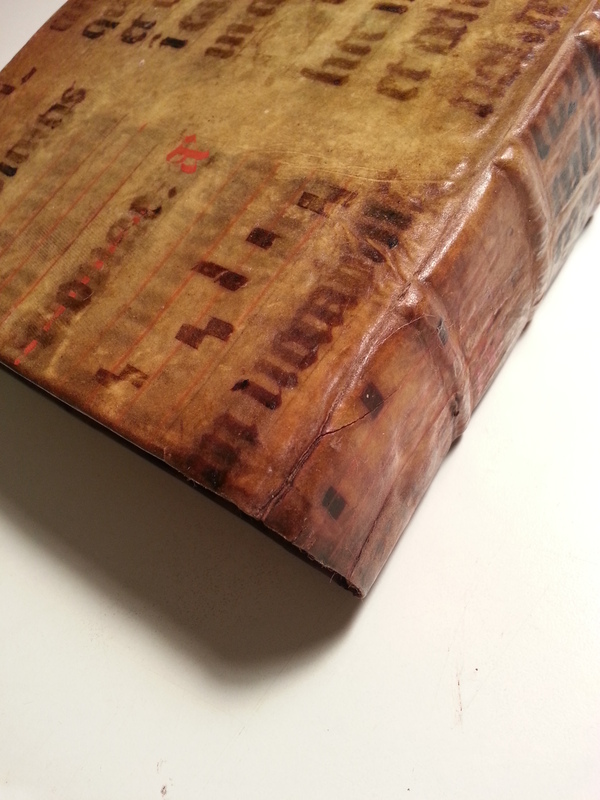 When I positioned the cover over the text block, the spine conformed perfectly, as you can see in the image above. 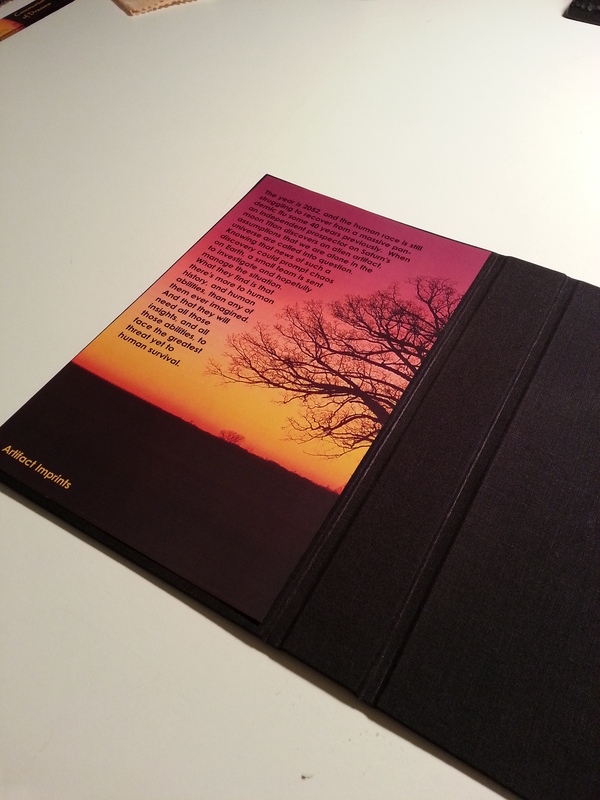 I went ahead and pasted out the endpapers and mounted the text block into the cover. Yup — that right there is what is technically known as an “oops”. 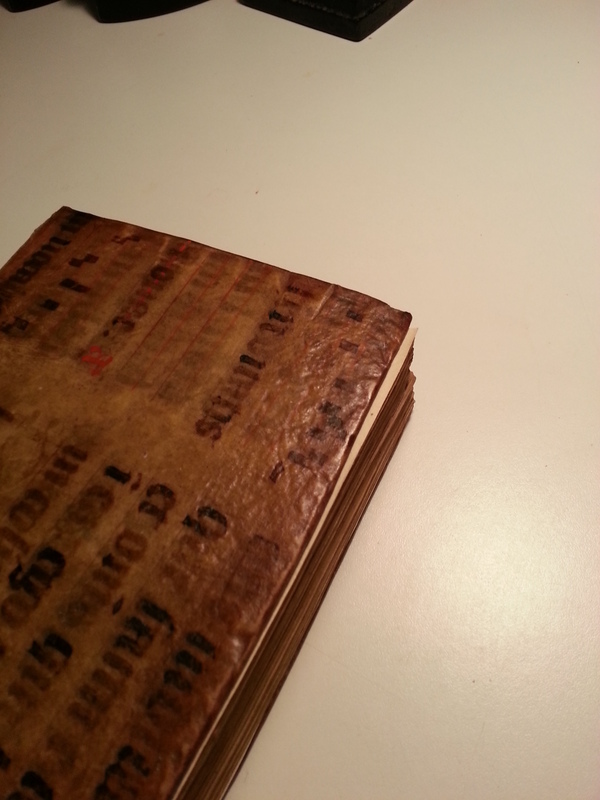 The cover doesn’t *quite* come around far enough, with perhaps 2 mm of the text block showing at the widest point. I hadn’t been able to stretch the cover (or compress the text block) enough. The cracks are still there, but they’re no longer a structural problem. The underlying kozo will now handle the structural forces. That should mean the cover will work as intended, and propagation of the cracks further down the spine should be stopped for at least a couple centuries. It’s not a perfect repair, and that tempers any temptation I might have to inflate my ego any more. But it’s a pretty damned good repair, one I can take a measure of satisfaction with. Thanks to everyone for helping make the promotion a success — I think we got an excellent response for a book which has been available for some 18 months, with 1,366 total downloads of Communion of Dreams! That breaks down as 1,193 in the U.S. market, 66 in the U.K., 102 in Germany, two in India, and 3 in Canada. It may be silly, but I think that it’s a real hoot that there are people in India who have downloaded my book. And it wasn’t just Communion of Dreams — Her Final Year also was downloaded by someone in India with this week’s promotion. And altogether there were 272 total downloads of that memoir. I’ve been reading science fiction for over 40 years, and it’s my favorite subject, but I’ll be very honest and say that even after reading this entire book, I could not understand what the artifact actually was. I also did not understand what the burl was, nor what the gel was. I think this story could have been a lot more exciting if it was trimmed down by 50%. I applaud the author’s first efforts at writing, but I think he should try again. So maybe they’ll like St. Cybi’s Well if I don’t spend too much time with characters, setting, or have too many difficult concepts in it. And I probably shouldn’t have it set in Wales, since that’s not science-fictiony enough. I’ll have to keep that in mind. If you have some thoughts on the book to share, I’m always happy to have the additional reviews. Well, maybe make that I’m usually happy to have the additional reviews.